A private investigator digging into a case, a murder that happened eight years back, and for which her client was convicted and sentenced for… not the usual run-of-the-mill mystery I think. I’ve only heard of a couple of Perry Mason novels by Erle Stanley Gardner that remind me of such a plot. A mystery I’m sure I’ll like digging into. 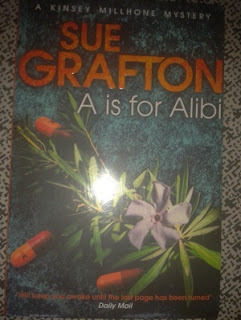 First off, I would like to say that I hadn’t heard of Sue Grafton or the alphabet series of mysteries before. It was a chance find from Nimue’s giveaway earlier that I saw the title, and it was the second one that made me want to read it, that and the cover which had a gun on it. Personally, I don’t like guns on a cover page, so I requested that since there was one version without a gun, could I have that instead? I got my wish, and the book came by yesterday evening. As you get from the back cover itself, the protagonist of this series is a private investigator named Kinsey Millhone, who stays at, and works at a city in California called Santa Teresa. She is thirty-two years old, twice divorced. And recently she has killed someone. The story, narrated in first person, starts with that statement, and a description of her and her life. She is hired by Nikki Fife, wife of Laurence Fife, a divorce lawyer who was murdered eight years previously, and for which Nikki was convicted. She is hired to prove Nikki is innocent of that crime, not for a reason for revenge, but Nikki’s curiosity and determination to know who killed Laurence, and put her in prison for a crime she did not commit. Kinsey does not commit immediately to the job, but goes to the lieutenant in the Santa Teresa PD who handled the case eight years back, looks at the evidence he had collected back then, and seeing ends not meeting in the case, agrees to look at it for Nikki. Kinsey follows the trails of Laurence’s life… his ex-wife and his two kids from that marriage, his old partner at the law firm, his secretaries there and their parents… whatever angle she can open up with her hunches and evidence that she can find. She is thorough, not wanting to miss anything that can open a new lead in the case. She falls in love with someone, and not having been with a man for years, finds herself bending to his charm and good nature. She goes out of the city as she follows Laurence’s old steps, and doesn’t miss a beat. Her prying into old closed matters isn’t well received by some, and she opens a Pandora’s Box for some others which make her feel guilty. In the end, a twist comes that she doesn’t expect and which leaves her doubtful if she was a novice to have not seen that, get distracted and making assumptions that had no base. Also for the First Reads Challenge at b00k r3vi3ews blog. I have rarely read first person novels. This does sound interesting. will keep a look out for this author. Yes, please do, Nimue :) I think you will like it. I always wanted to start with this series. But something or the other always came up. Maybe this is as good as any time to begin. Also Leo, can you change the label to "Series - Kinsey Millhone"?